From the tea garden into the cup. aroma – we supply you with a top-class all-round package. Functionality and flavour are unified. Travelling around the best growing regions worldwide. All teas are carefully checked for residues. Manufactured for you and provided with your own brand names. 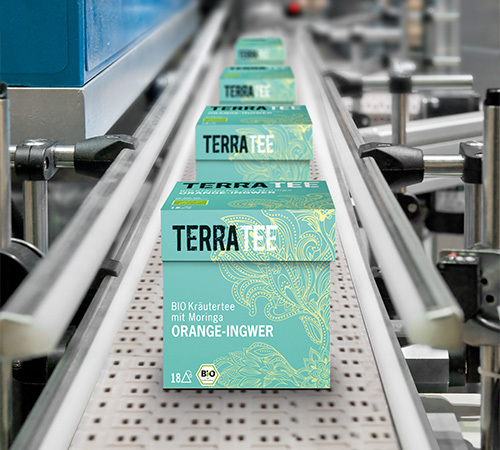 Thüringer Kräuterhof specialises in the production and trade of high-quality teas. Established in 1922, Thüringer Kräuterhof can reflect on many years of tradition and a great wealth of experience. For the production of our high-quality products, we exclusively use exquisite teas and top-class components from the best growing regions which comply with our strict quality requirements, because quality is at the forefront of our thoughts and actions. We rely on modern, environmentally-friendly technology for the production and packaging of our teas. Therefore, we are able to act flexibly and sustainably, and simultaneously fulfil individual customer wishes. The food trade has very precise standards for its suppliers. Thanks to our experience and elaborate packaging concepts, we are in a position to skilfully implement these and nevertheless develop a unique, innovative product. For the best flavour, we exclusively use rough-cut or whole-leaf teas from the best regions of origin. In combination with our large-volume pyramid bags, in which the ingredients can optimally develop, a quality product is thus created for ultimate tea enjoyment. Terra Tee or Imperial Garden? Are you looking for an experienced and strong partner for the development and production of your own tea blend, in a packaging which is appropriate to you and which you can sell under your own trademark?